A Paper Garden: Oh My! An award! Danni over at Danni's Dreams gave me this super cute blog award. Thanks so much Danni! Now I'm supposed to nominate 7 other blogs and they can put the logo on their blog too. Hmmm... only 7, I'll stick with ones I have not mentioned before. Have you seen Mel over at Mel Stampz? I'll tell you, I'd like to nominate the girl for an honorary PHD in "crafty science". She is always coming up with new ways to use things. Tracy over at Durcan Designs. I've long admired her crisp clean style. She places all the elements of her cards perfectly and does great things with color. Debbie at 1of2Shoes - you have got to check out her Monday Morning Comics. Hee Hee. And here color pencil work is amazing. Beth over at Sunflowers and Dragonflies - she has wonderful style and is so generous in sharing what she knows through all her tutorials. Which leads me to Susanna over at Card of the Week, which is how I discovered Amazing Paper Grace. She does this absolutely amazing job of scouring the Internet and finding all kinds of nifty projects and tutorials. I could spend hours just looking at the things she gathers. I don't know how she does it. Michelle over at Inspiration Blooms. She creates beautiful projects and I love the photos of her garden flowers too. So... there are 7, but I could list so many more! Patti at Pat Creates gave me this award too! "They like me, they really like me" (from Sally Field when she won an Oscar - am I dating myself??). Thanks so much Patti! I really appreciate it. Congrats on your award- you and your blog certainly deserve it!!! Huge congratulations on your award. 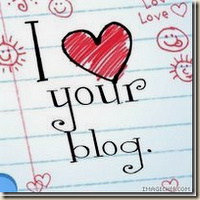 It's darling - I love your blog award. Well deserved too. I gave you an award too! :) Check out my blog!